Two days and one night is another one on the pile of “sad Celer albums”. The past year has seen some of his most brutal, with How could you believe me when I said I loved you when you know I’ve been a liar all my life casting the memory of a Midwest road-trip as a collection of deliciously mournful tape-loops, as well as the recent re-press of I love you so much I can’t even title this, which for those familiar with the history of Will Long may as well be called “press play to cry”. But where previous albums have tended to be quite abstract – the lush drone pieces only really opening themselves up to misery in the context of an album title or paired story – Two days and one night is more specific. 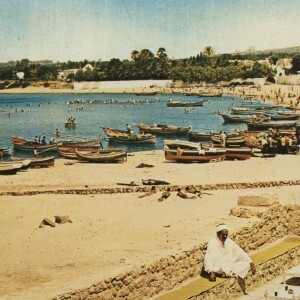 The album reflects on Celer’s trip to Tunisia, where he retraced the final steps of a great uncle who drowned off the coast. Long presents this as a narrative: steadily moving his pieces towards the sea and an eventual contemplation of death. An extended recording straddles “Spindles and fire” to “Sol Azur”, its Tunisian accented French bleeding like over-inked paper into lush, sun-drenched drones. It evokes both the scorched air of Tunisia and an early sense of unease as the ending looms. When the scene is set, the music quietens, resurging somewhat for “In all deracinated things” but reducing to a lone recording of waves with “The fear to touch the sand”. In these points of simplicity, the artist displays enough restraint to let listeners set their own scenes. I can’t help but imagine what it might be like to sit and stare at the sea which claimed a loved one. Surprisingly the album is not overtly sad, but instead ambiguous, as these moments often are. I recently attended a friend’s memorial service, and afterwards took a long walk around the place he grew up. Being there – both happy and sad, consumed by death yet very much alive – helped me to understand just how impressive Two days and one night really is. The album reflects the experience perfectly, yet with such personal and geographically situated sounds it is unmistakably Celer’s own. It contains enough universal feeling to inspire sympathy, but just as Will followed in the footsteps of his uncle, we must follow in his. The album cannot be separated from the sun-soaked tiles and peaceful ocean, presented here with a mature and graceful empathy fit for a man who’s been recording for over a decade. We face loss through his learned eyes and find a rare, intimate calm. Next, an intriguing conceit from Celer keeper, Will Long: ‘In 1984, my great uncle drowned in the sea off the coast of Hammamet, Tunisia. He was 80 years old. He arrived in Tunis from his home in New York City, staying one night in the Hotel Amilcar, from where he sent a blank postcard back to his family home in Mississippi. The next day he traveled to Hammamet, where he rented a hotel room, bought swimming trunks, and by the afternoon had drowned in the ocean.’ Two days and one night deploys a similar template to Sky Limits—immersive stream of consciousness interleaving topographically-inclined field recording-based vignettes with mellifluous micro-orchestral billows. ‘In 2015, I retraced his steps from Tunis to Hammamet. Set part in fiction and part in reality, Two Days and One Night is both a document of my own experience and a re-imagining of what my great uncle might have heard and experienced 31 years before.’ “Spindles and fires” took our fancy. Coincidentally, Celer‘s Two Days And One Night is another album about loss and dealing with grief. On this album, Will Long retraces the steps his great-uncle travelled in 1984, from Tunis to Hammamet,‘where he rented a hotel room, bought swimming trunks, and by the afternoon had drowned in the ocean.’He was 80 years old. The ambient washes of sound in the longer tracks are merged with shorter – sometimes almost inaudible – local field recordings, creating a dreamlike and slightly exotic atmosphere. It is amazing how personal Celer‘s music feels, considering his enormous output. But, as personal as its background is, this music tells a story everyone can relate to somehow. In 1984, Celer’s 80-year-old uncle took a trip to Tunisia, tragically drowning while swimming in the ocean on only the second day of having been there. An awful incident yes, but Celer wanted to retrace his uncles footsteps by visiting the same places he did back then and chronicle the activity through ambient. And ambient it is, the usual Celer clouds drifting aimlessly by, this time with some definite sun-scorched-ness to them. I’m getting orange and yellow from this. It could easily be mournful or accepting of his uncle’s fate both at once, the chords toeing the line quite nicely between the two. Snatches of a French man speaking can be heard buried under various points, which sort of makes sense as Tunisia is a land once stolen by the French. It’s nice to hear Celer do music for places worldwide, and I think carrying on this route would promise some interesting twists and turns in his musical journey. In 1984 Will Long’s great uncle, then 80 years old, went to Tunis from his home in New York, stayed one night in the Hotel Amilcar, from where he sent a blank postcard back to his family in Mississippi. The next day he travelled to Hammamet, rented a hotel room, brought swimming trunks, and by the afternoon drowned in the ocean. That’s what Will Long tells us in the information of his new release as Celer. In 2015 Long undertook the same travel, in the same time frame and made the recordings, which he used for the music on this CD. There are quite some field recordings to be noted in this, but also the trademark long sustaining sounds by Celer. iTunes opens up and calls this new age; and yes, sometimes I think Celer plays a bit of new age doodles, especially in a piece like ‘In All Deracinated Things’, which is the most ‘Celer’ like piece here. Yet I wouldn’t call this new age in the way it is presented now. The bits with just field recordings are way too strange for that; these are very silent pieces and have the faintest trace of sound. A piece like ‘Base Haze’ is simply a far away drone and far from the more musical touch we know. In that sense this album is more like a story, a radio drama (without words that is) mixed with the usual ominous drone/ambience of Celer. That makes this yet again an album by Celer that is slightly different from the many that he does – and looking at his bandcamp there is a lot of Celer available (and many that I didn’t hear). I am never sure what is the deciding factor when it comes to releasing music on a physical format or keep it as a download only, but somehow it seems that Will Long knows perfectly what is a bit different and that those should be available on CD or LP. If you are more of casual fan, then I’d say this particular one is one to get, mixing the classic Celer sound with some refined field recordings, wilfully obscure sounds and all of that into a great story/journey. However sad the origins of these are. Es ist nicht das erste mal, dass der Ambientmusiker Will Long alias Celer die Inspiration, die er auf Reisen gesammelt hat, zum Ausgangspunkt seiner Soundscapes macht. Auf „Two Days and One Night“ entwirft er ein Narrativ, zu dem der oft strapazierte Begriff „vielschichtig“ einmal wirklich passt, denn hier werden zwei Reisen in einer Geschichte verarbeitet: eine eigens unternommene und klanglich dokumentierte, daneben die lange zurückliegende Reise einer anderen Person, die er aus Erzählungen und Spekulationen rekonstruiert hat. Gemeinsam ist der Ort, an den es die beiden Reisenden verschlug, und die Familiengeschichte der beiden als Rahmen. Mitte der Achtziger flog ein Großonkel Longs von New York nach Tunesien und mietete sich in einem Hotel in der Küstenstadt Hammamet ein. Von dort schrieb der bereits Achtzigjährige noch eine Postkarte an seine Familie zuhause. Tags drauf besorgte er sich eine Schwimmausrüstung, schwamm ins Meer hinaus und ertrank. Dass die Postkarte keine Nachricht, nur die Adresse der Empfänger enthielt, musste aus der Begebenheit fast zwangsläufig einen Mythos machen. 2015 besuchte Long Tunesien und reiste auf den Spuren seines Großonkels von Tunis nach Hammamet. Auf „Two Days and One Night“, in den Samples, aber auch im atmosphärischen Narrativ der Musik, fließen beide Geschichten immer wieder ineinander – die Eindrucke, die der Musiker aufnahm, die Frage, auf welche Details sein Verwandter damals vielleicht geachtet hatte, die typischen Klänge der Orte, die beide – vermutlich – gesehen und gehört haben, und die tiefe, undurchdringliche Traurigkeit, in die sich der Onkel, der zwangsläufig fiktionale Züge bekommt, und der Musiker gleichermaßen einschreiben. In den alles überflutenden Wellen aus schweren Synthiesounds, die in beinahe jedem Stück die zahlreichen Feldaufnahmen früher oder später überfluten wie das Meer einen einsamen Schwimmer, scheinen beide Geschichten und beide Protagonisten miteinander zu verschmelzen. Das Verschwinden zahlreicher Samples unter schweren Soundschichten ist in der Tat ein besonders auffälliges merkmal dieses Albums, denn in der Vergangenheit hielten sich der ambiente Rahmen und die an markanten Orten aufgeschnappten Details meist die Waage, Samples brachen immer wieder durch die Oberfläche der Soundscapes und bewirkten so, dass die Arbeiten einen hörspielartigen oder, wenn man so will, semi-dokumentarischen Charakter bekamen. Auf „Two Days and One Night“, dessen Titel bereits zeitliche Kürze impliziert, fällt beinahe alles dem Verschwinden anheim: brummende Motoren, hastige Schritte, tolle Melodien auf orientalischen Flöten, eine Durchsage auf französisch, vermutlich an einem Bahnhof, die Brandung. Wenig davon hat lange Bestand. Es dauert nur eine kurze Zeit, bis sich ambiente Sounds, filigran gestaltet und stets in gemächlicher vibrierender Bewegtheit, über all das legt, es aufgehen lässt in einer leicht sehnsüchtig eingefärbten Schwermut, die den ganzen musikalischen Raum ausfüllt. „The Fear to Touch the Sand“ enthält nur die Geräusche der sanften Gezeiten, leicht verfremdet zu einem dubbigen Vibrato – sie werden als einzige von keiner Welle verschlungen. All dies sollte einen trotz allem nicht zu allzu konkreten Bedeutungszuweisungen verführen, denn die Musik (und auch die Tracktitel, die größtenteils auf Orte und ihre Eigenschaften referieren) bewahrt sich eine Offenheit, die den Mythos dieser beiden Episoden näherbringt und zugleich bestehen lässt. On ne présente plus Celer, désormais le projet solo de Will Long, dont nous parlons ici pour la dixième fois alors qu’il sort environ un nouvel album par mois. Après Akagi qu’il sortait sur Two Acorns, son propre label, on le retrouve cette fois sur la jeune structure américaine Sequel, fondée fin 2015. Pour qui connait un peu les productions de Will Long, disons que ce nouvel album est logiquement dans la lignée des précédentes et on se demandera même comment il pourrait en être autrement tellement le musicien est constant depuis maintenant plus de 10 ans. Pour les autres, disons que Celer produit une musique ambient minimale, souvent rapprochée du drone. Alors qu’il nous avait habitué aux longues pièces, Celer nous surprend un peu ici en plaçant de courts interludes entre les pièces ambient qu’on lui connait. Ainsi l’album débute avec la flûte d’un musicien de rue et des bruits de pas, posant une ambiance orientale sur ce From The Bus To The Corner, Past The Hypostyle Halls. On est à Hammamet alors que Will Long est revenu sur les traces d’un grand oncle qui s’est noyé 31 ans plus tôt au large de la ville tunisienne. Un peu plus tard on trouve des extraits d’un discours de Thomas Sankara probablement capté sur une télévision, l’ambiance sonore de la côte, le calme d’un hôtel avant que la télé ne s’allume, ou encore le bruit de la mer tout au long de The Fear To Touch The Sand. Pièces principales et interludes s’enchaînent, formant presque une seule et même composition d’un peu moins d’une heure. Les nappes sous toutes leurs formes occupent logiquement une place importante sur ce disque, à commencer par le lancinant Spindles And Fires sur lequel plusieurs strates mélodiques se croisent de fort belle manière. Sol Azur en reprend le principe avec des tonalités un peu plus graves, mais surtout particulièrement douces, soyeuses, comme du velours, avec une mélodie répétitive. Sur In All Deracinated Things, on retrouve plus particulièrement le style du musicien, avec un son plus dense, des oscillations moins amples, rendant l’ensemble plus statique. On sera ensuite un peu surpris par Base Haze et son style atypique avec un drone extrêmement discret qui semble parfois être noyé dans un souffle, ou le bruit de la mer qui habite l’interlude suivant. L’album se termine sur le bien nommé Terminal Points. Le ton est ici beaucoup plus grave, mélodique mais sombre tout en restant purement ambient. Ce dernier titre fait alors écho à la fin tragique du parent de l’artiste et on devine en arrière plan le va et vient de la mer. Si parfois on se dit que Celer joue un peu la facilité, on trouvera qu’il essaye ici d’évoluer un peu, tant dans la construction de l’album que dans son approche mélodique. Une excellente surprise.